Language alternation (code- or language-switching) has been a long-standing focus of research in language classrooms and multilingual communities. 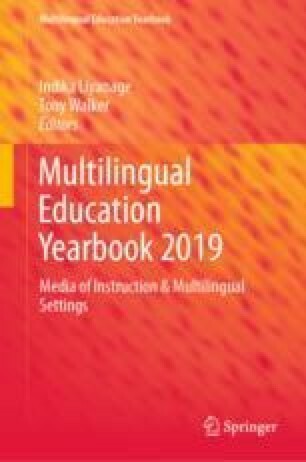 We know about its functions, about the distribution and frequencies in speakers’ use of their languages, about the cognitive impact of language alternation on learning, and about social and interactional accounts of language alternation that are concerned with indexing shifting identities and social inequalities, and with showing how they are deployed as interactional resources in languaging practices. This chapter presents an overview of recent research in the Conversation Analytic (CA) tradition which treats language alternation in the foreign language classroom as a social practice. It describes how the micro-analytic methods of CA have contributed to understanding language alternation through analysis of two samples from Australia: a secondary Italian foreign language classroom and a tertiary Japanese foreign language classroom. The focus of the analyses is on the language alternation practices between teacher and learners and between learner and learner. The chapter ends with a consideration of the implications of this research for language teacher education with reference to medium of classroom interaction. Antaki, C. (2011). Six kinds of applied conversation analysis. In C. Antaki (Ed. ), Applied conversation analysis: Intervention and change in institutional talk (pp. 1–14). Basingstoke, UK: Palgrave Macmillan. https://doi.org/10.1057/9780230316874.0006. aus der Wieschen, M. V., & Sert, O. (2018). Divergent language choices and maintenance of intersubjectivity: The case of Danish EFL young learners. International Journal of Bilingual Education and Bilingualism. https://doi.org/10.1080/13670050.2018.1447544. Filipi, A. (2018b). Using language alternation to establish epistemic status in an Italian as a second language lesson. In P. Seedhouse, O. Sert, & U. Balaman (Eds. ), Conversation analytic studies on teaching and learning practices: International perspectives. Hacettepe University. Journal of Education, 33(Special issue), 36–53. https://doi.org/10.16986/huje.2018038795.